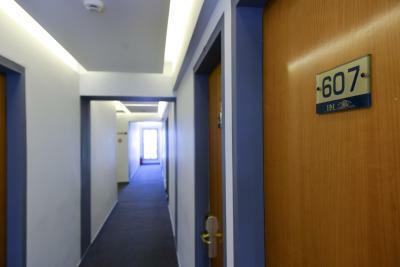 Lock in a great price for Mediterranee – rated 8.2 by recent guests! +Staff is very friendly! 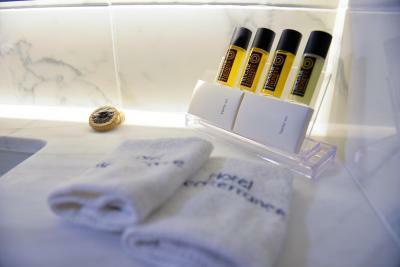 +Our room was exceptionally clean. 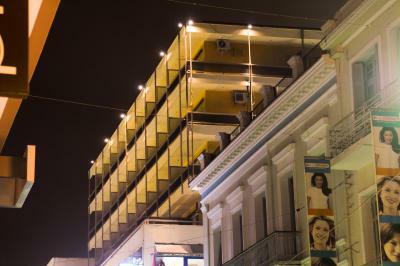 The location oft his hotel was great being in downtown Patra. We were only spending one night at this location so the value/price for the room was excellent. The front desk staff was very friendly and answered all of our questions. 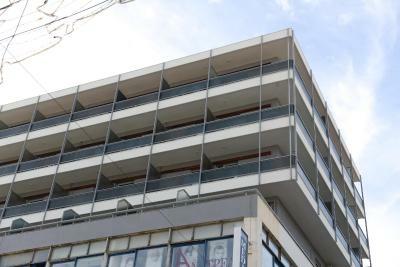 Excellent location just at the center of Patras. The room and the breakfast were quite decent. Excellent location, in the shopping centre of the city. The staff was very accomodating to some specific needs I had about the room I wanted to stay in! Convenient location, very close to the bus and train terminals. Good breakfast for the value. Roomy unit for a family of 4. Great Greek yoghurt at the buffet. Location is great and right in the middle of the town. 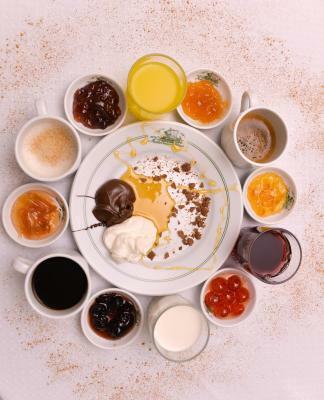 Lots of choice at breakfast. Air conditioning good. Mediterranee This rating is a reflection of how the property compares to the industry standard when it comes to price, facilities and services available. It's based on a self-evaluation by the property. Use this rating to help choose your stay! One of our top picks in Patra.Featuring a bar, Mediterranee is located in the center of Patra, a 9-minute walk from Psila Alonia Square. 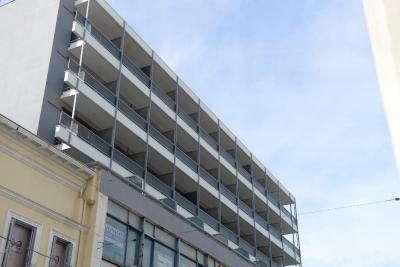 The property is close to Patras Port, Roman Theater of Patras and Patras Castle. 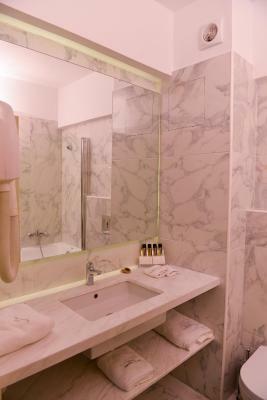 Offering a private bathroom fitted with a bath or shower and a hairdryer, all air-conditioned rooms at the hotel also have free WiFi. A buffet breakfast can be enjoyed at the property. Guests may relax by the bar with refreshing drinks or a tasty cup of coffee. Staff speak German and Greek at the 24-hour front desk. The hotel location offers easy access to all means of transportation. Archaeological Museum of Patras is 1.4 mi from Mediterranee. 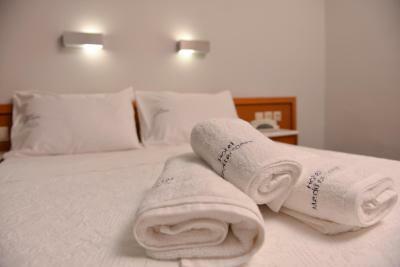 The nearest airport is Araxos Airport, 18 mi from the accommodations. 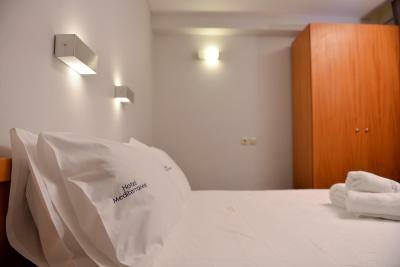 When would you like to stay at Mediterranee? Offering a TV, this air-conditioned room is fitted with a bathroom with hairdryer. Free WiFi is provided. 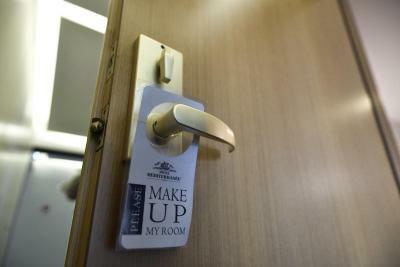 Offering more space and a flat-screen TV, this air-conditioned room is fitted with a bathroom with hairdryer. Free WiFi and a coffee machine are provided. 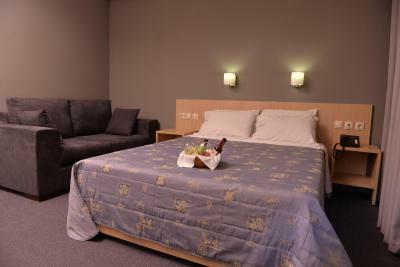 Offering even more space and a flat-screen TV, this air-conditioned room is tastefully decorated and fitted with a sofa. 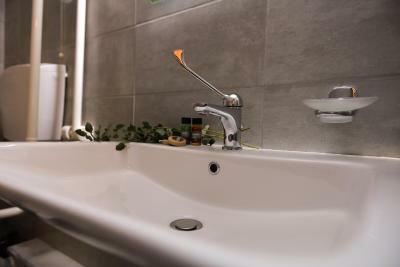 It features a bathroom with hairdryer and a mini-bar. Free WiFi and a coffee machine are provided. 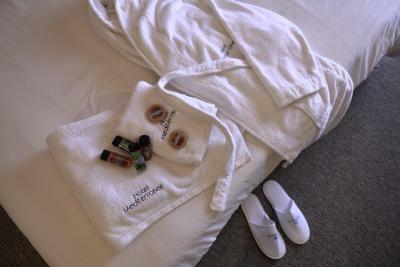 House Rules Mediterranee takes special requests – add in the next step! Mediterranee accepts these cards and reserves the right to temporarily hold an amount prior to arrival. Extremely noisy! When a school needs to stay in a hotel, they should not offer rooms to other guests. There weren't any chairs inside the room. And no hanger in the wall for the coats. The bed was squeaky and that comfotable. Centrally located hotel - ideal location to explore the city and go everywhere on foot. Nice balcony and good view on the top floor. It was also on the budget side. The hotel was very clean and comfortable. 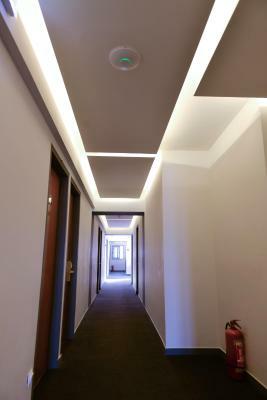 We have paid more at other hotels in Patra before, but we actually preferred this hotel. the location was great. in the heart of the city. the hotel was very clean. Very cold, not clean, smoking smell on the room. Parking is public and far away around 500m. 1) Bracket for shower head! It's a small thing, costs a couple of Euro and 10 minutes to put up, but makes taking a shower so much easier and more pleasurable. 2) Check-Out: no one on reception - sat waiting to hand in room key / check-out for nearly 10 minutes before someone appeared (...too busy around the corner chatting!) and then still no apology...or smile :-( 3) Breakfast - not that I was expecting a gourmet offering but even so, Fresh Orange Juice or a good one from the carton would be nice - not watery cordial type. Items such as the fruits (peaches, fruit cocktail etc), yoghurt and cheeses on offer should really be kept chilled. The dining room area itself could do with a quick lick of paint to freshen and brighten the area and make it look a little more inviting and clean. Maybe my critique is a bit more than normal in this area, but that's due to working in the food / hospitality industry. Sorry! 4) Biggest issue for me - Non-Secure Wi-Fi...NOOOOOO!!! Be aware that the Wi-Fi network at the hotel is NOT secure. I would assume that a lot of the hotels guests would be potentially people on business, possibly sending sensitive / confidential emails etc. so really the Wi-Fi network should be a secure network. I know not all Secure Public Networks can guarantee security but even so, a Secure Network should be pretty much standard in hotels these days. Very central location, near to everything I needed. Bed comfortable, room warm, good shower pressure and plenty of hot water. The staff on reception when I arrived that afternoon and later that night were super friendly, welcoming and polite. Requested 3 single beds but got 1 x double and 1 x single. Clean. Plenty of towels. Staff very friendly and helpful. Excellent location for bars and shops!